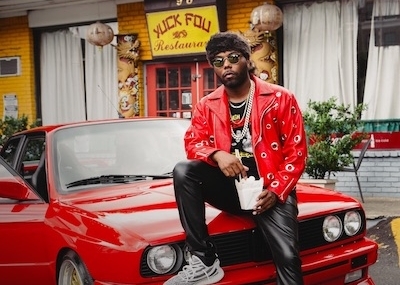 Four years after being voted in by fans as the People’s Choice selection for XXL’s 2014 Freshman Cover, JarrenBenton is starting over. He’s a seasoned veteran doubling down on the lyricism he made his name on, but his new music experiments with new emotion and bottles up the last few years of his life. In 2012, the Decatur emcee began making a name for himself on the outsider indie label Funk Volume, where he carved out a unique brand of ferociously lyrical, tongue-in-cheek horrorcore. At the label, his early mixtapes carried titles like Huffing Glue with Hasselhoffand Freebasing With Kevin Bacon, equal parts comedy and terror, like a goofy slasher flick come to life. Benton’s time with Funk Volume was punctuated by a debut album and a follow-up EP (My Grandma’s Basementand Slow Motion Vol. 1), national and international tours, and then, in 2016, the label’s sudden fold. Ever since, Benton has been reinventing and reintroducing himself. “People were introduced to me as the ‘Skitzo,’ guy” he says, harking back to his breakout single nearly seven years ago. “They had a certain expectation that was very outlandish, very lyrical. Lately its’ been more personal.” Benton has been a prolific mixtape artist and voracious rapper throughout his career, but his albums have been heavier and more carefully tuned. Last year he released The Mink Coat Killa, an album-length homage to the gritty New York hip-hop sound Benton grew up admiring from afar. The new tracks find a middle ground. Benton still has a flair for the dramatic, but instead of raps that brood with bitter reflection, he sounds like he’s having fun again. “People wanted to hear that fun Jarren,” he says. “It was getting too dark.” Still, there’s a bite to everything Benton touches, and even his upbeat bangers have a caustic edge. “Money Bag” sounds like an extended taunt at the industry, Benton borrowing a radio-friendly flow to charm his way into the door and detonate the party with a twisted eccentricity. On the lead single “Don’t Need You” Benton lifts the veil on the pent up and mysterious behind-the-scenes drama that led to Funk Volume’s close. It’s the first time Benton and Hopsin have reunited since the label broke up, and the collaboration snaps the focus back onto the type of masterly lyricism that ingratiated fans in the first place. There are also tracks like the pensive “Shooter,” where Benton climbs into the national gun control controversy and confronts mental health crisis. “I was really debating putting that song out there because of what’s going on,” Benton says. “The song is basically inside the mind of a high-school shooter. But it accounts for what this person is going through on a day-to-day basis to make them feel this way. I hope that people don’t think this is insensitive. The intentions were not malicious, I didn’t want people to think I was making fun of this.” After a career of hopping back and forth from frantic lyricism to considered introspection, Benton has figured out how to occupy both lanes at once.